Knockmealdown gives its name to the range as a whole, but the earlier name for these hills, along with the lower hill country to the east, is Sliabh gCua. There is a traditional air entitled Sliabh Geal gCua na Féile, meaning 'bright Sliabh gCua of the festival'. The name Maoldomhnach means ‘devotee of the church’. The surnames derived from this are Ó Maoldomhnaigh (anglicised Muldowney) and its variant Ó Maoldhomhnaigh (anglicised Moloney). Moloney is still a common surname in the vicinity. Some sources translate the name as Cnoc Maol Donn, 'bare round hill', but this is a poor attempt to interpret the name only on the basis of the modern anglicised form. The form Knockmealdowny, recorded in the Civil Survey in 1654, shows that was clearly an additional syllable. Knockmealdown is the highest mountain in the Knockmealdown Mountains area and the 47th highest in Ireland. 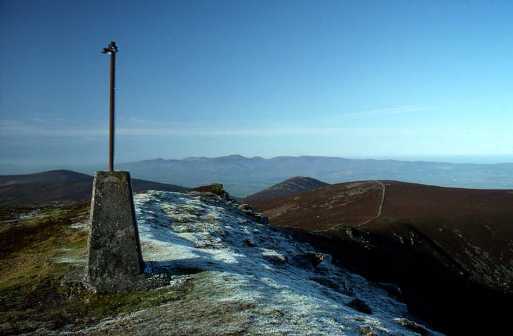 Knockmealdown is the highest point in county Waterford.